Wonderful grandchildren are a blessing to be enjoyed year round, though there's never more excitement than at the holidays! The love and joy of the season is captured in the 7 grandkids - loving hearts at Christmas personalized ornament that will sparkle from the tree or other favorite display location. Featuring a Christmas star on top, plenty of glitter and a festive holly sprig, these grandparents ornaments personalized from Russell Rhodes will become instant classics when arriving in our custom velvet gift and storage bag. 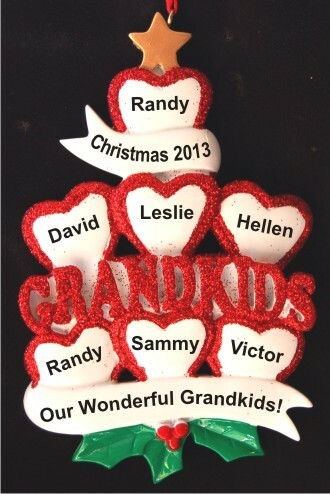 We'll add your information by hand in a stylish font to make the stacked hearts 7 grandkids personalized Christmas ornament a piece to delight the whole family.